1 -. A fast, inexpensive and attractive conscructive system in order to meet deadlines. 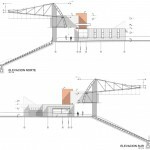 This project is conceived from a constructive logic, modular and prefabricated system suitable to build the project in phases. 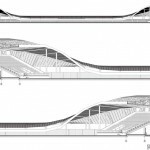 The galvanized metal trusses, rhythmically repeated setting the cloak that covers the stadium, these are coated with aluminum, opaque or microperforated panels generating opaque or semi transparent planes. The whole system of new bleachers, is thought based on prefabricated reinforced concrete, which are mounted on prefabricated columns and beams. 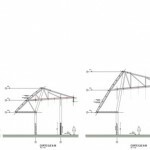 Generally speaking a high percentage of what is built modular, repetitive and prefabricated, buillt with regional materials and Chilena engineering, making it feasible and realistic to keep the project within cost and schedule proposed. 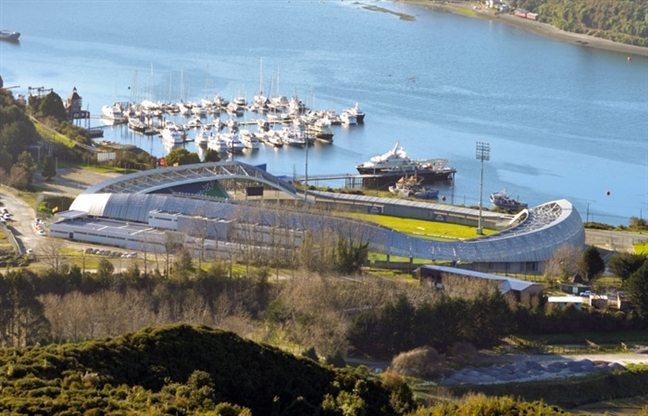 2.- A stadium with its own characteristics that embodies the identity and create a strong image for Puerto Montt. 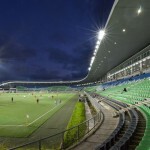 Chinquillue Stadium, is set on the edge of the canal and facing the island of Tenglo, this location, provides it with a privileged view, transforming it in a particular and unique feature, which is already part of the idiosyncrasies of the current stadium. 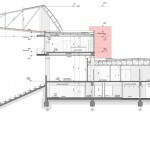 The elliptical design of the new project, makes a gesture of openness to the landscape, as the eaves in the area of ​​access across the street, which closed this great figure, are at one level below from the viewing angle degrees, allowing a clear and framed of the canal and island view. 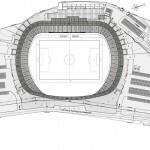 Thereby the land view becomes more than an accident of place, it becomes a target which is enhanced and framed with the design of the new stadium. 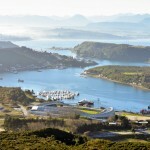 Moreover, as the name implies Puerto Montt, is closely identified with the sea and boats, is a port. 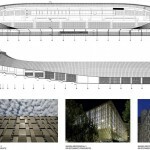 Such emblematic construction like this, come to contribute to this identity. 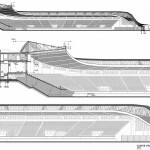 There is a strong formal analogy between the constructive method of the stadium and construction of boats … the cover and the envelope are in the constructive logic of a boat, with his ribs, frames and plating. 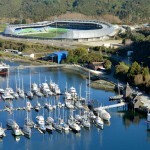 Thus, the morphology of the new stadium, plus all the programmatic and functional requirements, fits their privileged view of the canal and gives the city an emblematic building that accentuates Puerto Montt identity. 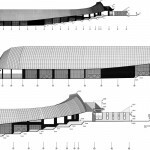 3.- A building that resolved, clearly, the programmatic and funtcional requirements. 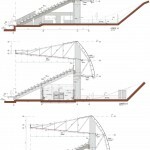 In the logic of a design competition, what matters at this stage in relation to the program and its functional aspects, is to give a simple and clear structure to the building, which has the potential to receive the inevitable and necessary amendments and adjustments to the original program bases. 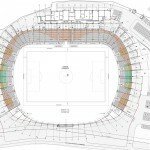 From our point of view, it is possible to partially reduce the requirements and surfaces for this stadium of 10.000 seat. 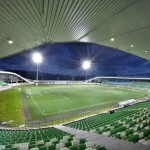 The program is structured in three levels; field level, bleachers level and grandstands level, in addition to distinguishing the central or neutral sectors, and the different teams. Currently the stadium is invisible to the city, from Pacheco Altamirano Avenue, is almost impossible to see it. 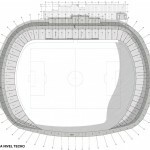 The closed form and elliptic proposed in our design allows the building to peek imposing a large horiozontal Avenue facade, advertising and show through the new stadium. allows the imposing building takes a peek at Avenue with a large horiozontal facade, announces and show through the new stadium. 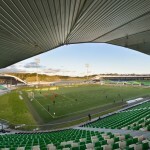 This meeting point between the stadium and the street becomes the main access, both vehicular and pedestrian to the site. 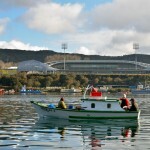 This goes to confer the stadium an urban and symbolic presence for the entire city of Puerto Montt. 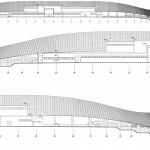 The 90 ° rotation of the trusses, generates a protective eaves and a long facade where the public accesses and ticket offices are located.